Imagine in the not-to-distant future that life as you know it has changed. The world has a new source of clean, renewable energy powered by an invention that your child or student has designed. Now imagine yourself paving the first stepping stone on their design journey by giving them The Extraordinaires® Design Studio. 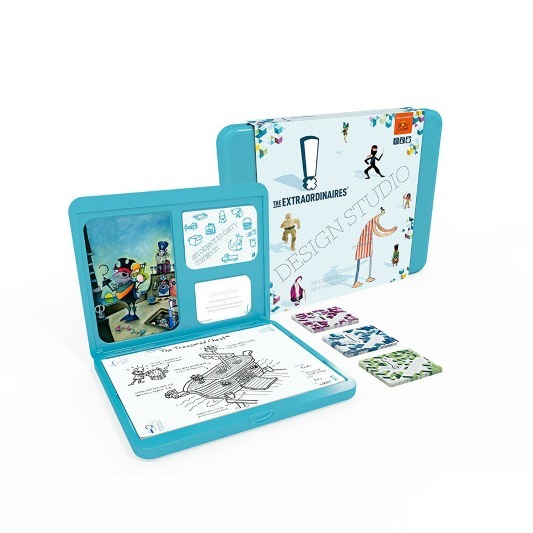 The Extraordinaires® Design Studio is a powerful learning tool that introduces children to the world of design, teaching them the foundations of design in a fun and engaging way. Your clients are The Extraordinaires® – over the top characters with extraordinary needs – and it’s the job of your student or child to design the inventions they require to fit their worlds. Choose your design client, from a Rap Star to a Vampire Teen… maybe even an Evil Genius plotting in his lair. Look at the exceptionally detailed illustrated character cards to learn more about them, their world and their needs. Once you’ve chosen your Extraordinaire, pick a design project. It could be a communications device for a Soldier or a drinks carrier for a Circus Acrobat. With over 200 design combinations, young minds will be entertained for hours. A good designer always asks lots of questions. Pick a Think Card to guide you through the 3 step design process of Research, Design and Improve. Could your object be made portable? Larger? Could it be made with more sustainable materials? Using the Think Cards helps develop design-thinking skills which are essential in the 21st Century. Extraordinaires Design Studio Deluxe – Teach Kids Design. Contents.